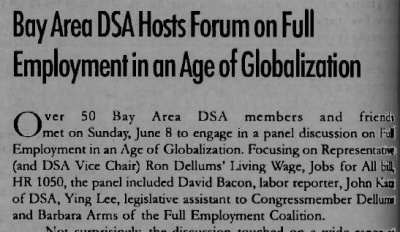 7 "Full Employment in an Age of Globalization"
Ying Lee Kelley... is a Northern California activist. She was married to the late John L. Kelley, emeritus professor of mathematics at the University of California, Berkeley. Lee, lived under war or the threat of war for most her years growing up in China and Hong Kong. She came to San Francisco as a teenager and spent her young adult life in the throes of a changing world that would catapult her into the anti-war movement around the same time that she became a wife, mother and teacher. Lee’s struggle for peace and justice led her into politics, where she would become Berkeley’s first Asian city council member. As protesters took to streets in December 2014, over perceived lack of justice in police shooting deaths in Missouri and New York, Ying Lee was among the downtown Berkeley crowd, holding her "Black Lives Matter" sign. And in response to possible closure and sale of the downtown Post Office, Lee, 83, has participated in rallies, spoken out, passed out pamphlets and taken other action. Protesting and rallying are nothing new for the former Berkeley councilwoman. To recognize her years of work, the entire California State Assembly will honor Lee on March 9, 2015 as a Woman of the Year for Assembly District 15, represented by Democrat Tony Thumond of Richmond. "She's been a tireless advocate for social justice issues for years," Thumond's District Director Mary Nicely said of Lee. "It's been nonstop for her." A former Berkeley Unified School District teacher, Lee also worked as an aide for East Bay congressional representatives Ron Dellums and Barbara Lee. She has served as a Berkeley Public Library trustee, volunteered at KPFA radio and is most currently involved in Save Our Berkeley Post Office and Grandmothers Against War. Her long history of activism has included work with the American Civil Liberties Union, the Asian-American Community Alliance, the Asian Law Caucus and as a Democratic Party delegate during the 1972 presidential campaign of George McGovern. She has engaged in numerous acts of civil disobedience and been arrested while taking part in protests around major issues over the years such as the Vietnam and Iraq wars, women's liberation, and the ongoing threat of nuclear war. Locally, her work has included a fight for rent control and greater racial diversity in Berkeley. And most recently there is her participation in the Black Lives Matter protests. "It gives you a measure of how wrong things are when you even have to say black lives matter," she said. "It's embarrassing. Every life matters." Virtually all of Lee's political activism has taken place within Berkeley, though her work with Dellums and Lee took her to Washington, D.C in the 1980s and early 1990s. Besides standing up for social justice issues, Lee has also broken barriers, including being the only Asian elected to the Berkeley City Council, where she served from 1973-77. Lee was a child when her family fled war-torn China in 1944 following a Japanese invasion. She saw firsthand the consequences of war, including poverty, starvation, sickness and pain. After arriving in San Francisco at age 13, Lee said she discovered the San Francisco Public Library and read voraciously, and also attended San Francisco City College following high school. Her family moved to Berkeley in 1951 and she graduated from UC Berkeley in 1953 with a degree in political science. She taught junior high and high school for 21 years. Each Thursday, you will find her and others in Grandmothers Against War passing out anti-war fliers at Union Square in San Francisco. She said she will continue fighting to keep the Berkeley post office from being sold and other post offices from becoming privatized. 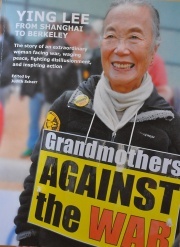 Ying Lee's story is captured in a 2012 oral history book called "Ying Lee, From Shanghai to Berkeley," edited by Judith Scherr and available through the Berkeley Historical Society. In January 1984 Ranko Yamada met with others in the Bay Area whose convictions mirrored his. They agreed to sponsor a meeting to initiate a Northern California Asian committee . Contacting friends and organizations they'd worked with over the years, the six of us — Ying Lee Kelley, Carol Ono, David Kakishiba, Steve Hom, Butch Wing, and Ranko Yamada — anticipated an attendance of maybe 60 people. But manning the reception table during the course of this January 12th meeting, Yamada greeted more than 100 people. We gave ourselves a name — Asian Americans for Jesse Jackson — elected officers, and collected $500 on the spot! In 1984 Ying Lee Kelley was co-chair of the San Francisco area Asian Americans for Jesse Jackson. On March 9 1984, concretizing the motto, "In unity there is strength," our individual groupings formed the National Network of Asian/Pacific Americans for Jesse Jackson. Sharon Hom and Leslee Inaba-Wong (New York), Evelyn Yoshimura and Linda Mabalot (Los Angeles), Michael Liu (Boston), Ying Lee Kelley and Butch Wing (Bay Area), and Cindy Ng (Network coor dinator) signed the joint statement. Ying Lee was once a member of Line of March. Address to the 1992 CoC conference of Ying Lee Kelly, legislative aide to Rep. Ron Dellums. I see by the notes that I'm identified primarily as an aide to Ronald V. Dellums. I have to tell you that what I'm going to be saying I've not discussed with him. So I stand totally on my own on this. Particularly since I'm going to be less formal than Carl and Leslie. Those two talks were absolutely wonderful, and I'd like to be able to build on that. Just one comment on Leslie pointing to Cuba as a beacon of light in our modern age. I would also like to say, since I was born in China in 1932, that to me, in spite of Tianamen Square, China is a beacon of light. And let me say why, because I think it does need explaining. It's hard to believe that a city like Shanghai, when I left China in 1944, could have people sleeping out in the street, dying on the street, being sick on the street _ like Calcutta today and pretty soon, I suppose, San Francisco and Berkeley. The China that I left in 1944 was probably 99.5 percent poor and desperate. The China that exists today has no hunger, and people are housed and people are clothed. That to me is a miracle of the century. And although I can deplore Tianamen Square, I have to say that the people who were killed by the colonialists _ the United States, Britain, Germany, France _ name the European countries _ and the people who were killed by Chiang Kai-Shek, their puppet, were many, many, many times more than the thousands who were killed in Tianamen Square. You never hear about the mass murder of the millions who were allowed to die by starvation and by privation. There was no dignity to life. I'm not a theorist. I've been accused of being an ideologue and, though I have read some semi-heavy stuff, most of the time I think of myself essentially as a Democratic Party hack. I've been a Democratic Party convention delegate three times. I was a McGovern delegate, and I've been a Jesse Jackson delegate twice. I went to the 1972 McGovern convention. I wore Viet Cong pajamas and a hat, and we tried to stop the bombing of the dikes. What makes some of us collaborate, if you will, with the Democratic Party? I think that I have to wave this document, "A Budget for New World Realities and the Rebuilding of America for 1993," which is the Congressional Black Caucus budget and the House Progressive Caucus budget [applause] for these United States for 1993. Some of you have heard [Rep.] Ron [Dellums] say that when he asked [House Speaker Tom] Foley for time to address the national budget in 1993, just a couple of months ago, he proposed that a day be set aside to discuss the administration's budget, a day be set aside to discuss the Democratic Party budget, and a day be set aside to discuss the alternative budget. This other piece of paper that I want to wave before you says, "Reinvest in America." I'm also Northern California chair for Common Agenda, a coalition of several groups that is trying to pull behind the Congressional Black Caucus. It used to be a very powerful coalition with a wonderful monthly newspaper, but it's been reduced lately, like everything else. But it has come together again. It meets once a month, on Mondays. They have divided up the pie so that education, health, reduction of the military, agriculture, economic conversion, infrastructure and transportation, children and families, energy and the environment, housing, the S&L loan bailout, deficit and taxes are all shown here, on one sheet..
"Full Employment in an Age of Globalization"
Endorsers of the project included Ying Lee, Peoples Non-Violent Response Coalition. Antonio Medrano, West Contra Costa Board of Education. This page was last modified on 5 June 2018, at 14:51.